There are a couple of people with birthdays in April who I wanted to make presents for this year. 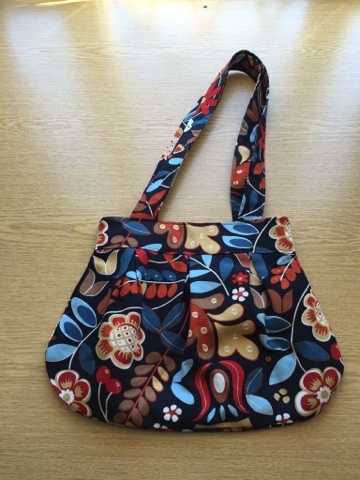 I bought the Anya Bag pattern when it was released before Christmas by So Zo. Although it was a bit late for any presents last Christmas, I thought it would be the perfect make for quite a few people I know. I love the retro styling and the fact it doesn't use much fabric. I bought some fabulous and ridiculously cheap fabric last time I was in Ikea specifically to make a few of these bags. I hadn't intended to even look at the fabric there and Gareth was amused that I had found yet another place where I could add to my stash. I've got some black cotton lawn I bought ages ago with a project in mind (I can't remember what now), but never got round to making it so its ended up being lining fabric for quite a few other projects and I used it again for this. I cut the pattern out including the button tab twice (to make two bags), and earmarked two buttons from my collection for the closures. The fabric was really thick and I found it hard to sew straight lines as the grain of the fabric kept distorting the stitching line. For this reason, the button tabs ended up looking awful and I decided not to use them as they are optional anyway. 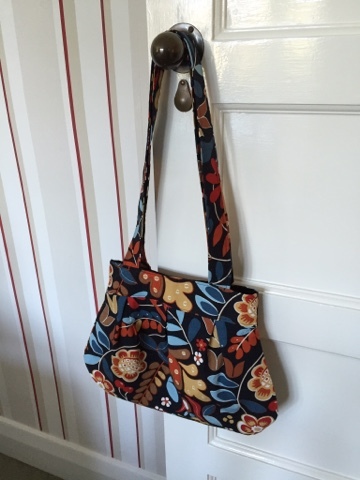 I really enjoyed sewing this bag as it was a pretty quick project and the instructions were clear - an ideal make for a present. I'm pleased with the end result, I hope the two lovely ladies I've made these for like them too.